A Su-27 ‘Flanker-B’ of the 582nd Fighter Aviation Regiment, part of the Soviet 4th Air Army based at Chojna, Poland, in 1990. In the same year this unit withdrew its 32 Su-27s from Poland and relocated to Smolensk, Russia, where it disbanded in 1992. Planned as a Soviet counterweight to the F-15 Eagle, the Su-27 entered service as an air superiority fighter but has demonstrated considerable growth potential, being further developed as a carrier fighter and proving to be an export success. 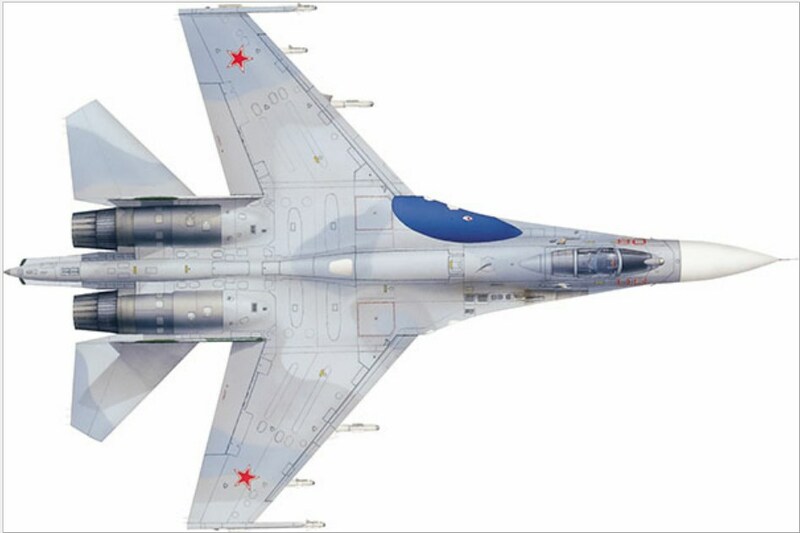 Sukhoi began work on its T-10 design in 1969 with the aim of creating a highly agile fighter that possessed a very long range, heavy armament and sophisticated sensors. In order to maximize manoeuvrability, the fighter was planned from the start to be unstable, and therefore required a fly-by-wire (FBW) control system. The first prototype of the T-10 took to the air in May 1977 and received the NATO reporting name ‘Flanker-A’. However, in its initial form the four original T-10 prototypes displayed a number of serious deficiencies and the aircraft required a wholesale redesign, re-emerging as the radically reworked T-10S-1 of 1981. The T-10S entered series production in 1982, and received the in-service designation Su-27 (NATO ‘Flanker-B’). 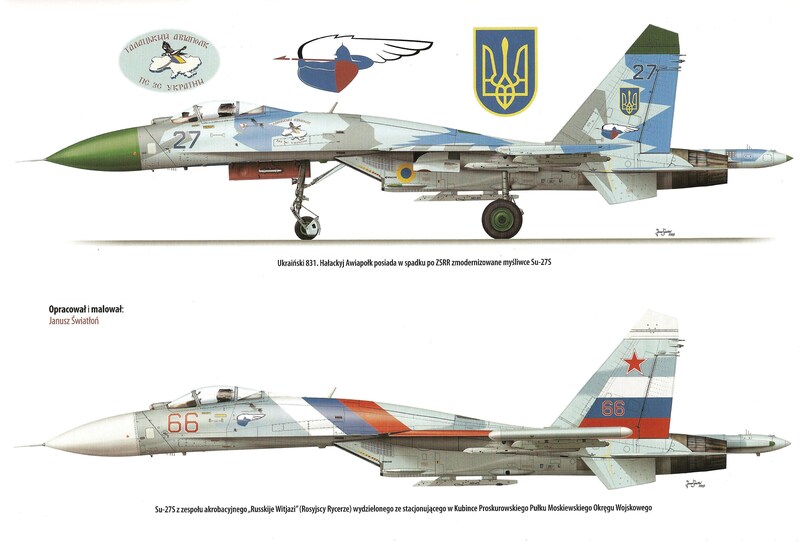 Service entry followed in 1984 and the single-seater was joined by the Su-27UB (NATO ‘Flanker-C’) fully combat-capable two-seater that first flew in 1985. 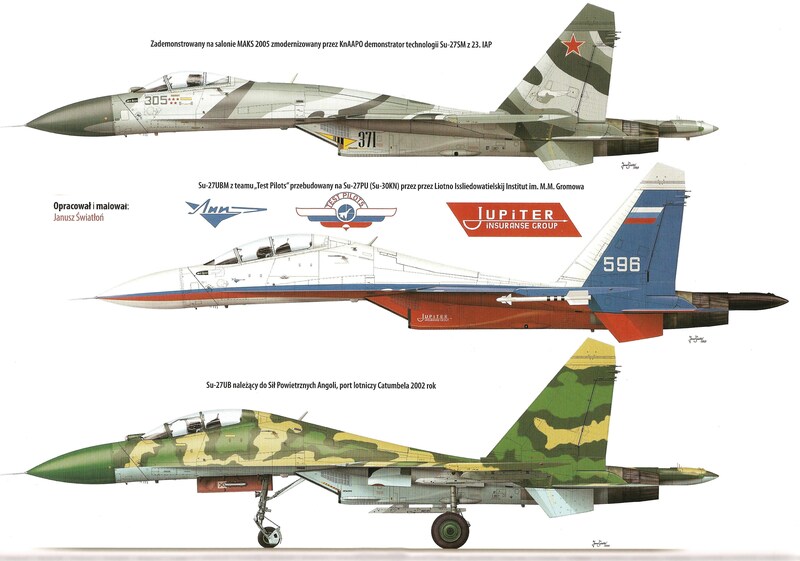 By the end of the Cold War, a total of just over 400 Su-27s of both versions were in Soviet service. After the collapse of the USSR, ‘Flankers’ were passed on to successor states, and Russia began an export drive for the fighter. First of the export models was the baseline Su-27SK developed for China, basically similar to the ‘Flanker-B’, but with with additional air-to-ground capabilities. China also received a ‘Flanker-C’ equivalent, the Su-27UBK. After around 80 Russian-built Su-27SK/UBKs were delivered, China launched licensed production of 95 additional single-seat ‘Flankers’ (designated as J-11). Vietnam was the second customer, ordering a first batch of six ‘Flankers’ (including one two-seater), and a second batch of two Su-27SKs and four Su-27UBKs. 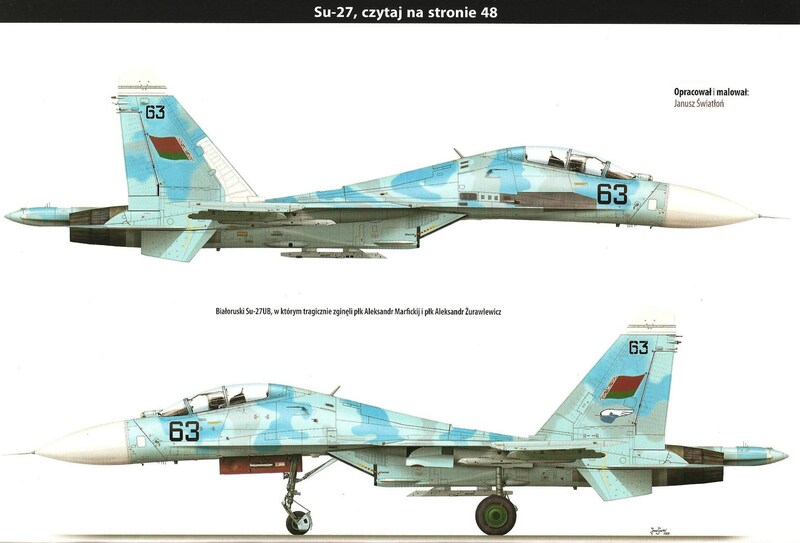 Ethiopia purchased second-hand ex-Russian ‘Flanker-B/ Cs’, while Indonesian acquired two Su-27SKs and three of the improved Su-27SKM single-seater (the latter equivalent to the Su-27SM described later). ‘Flanker-B/C’ exports also included ex-Ukrainian aircraft sold to Eritrea and Ethiopia, while Angola received two ‘Flankers’ from an unknown source, likely Belarus. The basic ‘Flanker’ continues to provide the backbone of the Russian Air Force fighter fleet, with 180 examples in service in 2013. These aircraft are undergoing a mid-life upgrade, transforming them into the Su-27SM that is based around a new avionics suite. Delivered to front-line regiments from 2004, the upgraded Su-27SM has been complemented by a small batch of newly built aircraft with improved avionics and mission equipment, designated as the Su-27SM3, which were delivered in 2011. More recently, Russia has procured three more new-build ‘Flanker’ versions: the two-seat Su-30M2 and Su-30SM, as well as the thrust-vectoring single-seat Su-35S. The Su-30M2 and Su-30SM are both domestic versions of the significantly improved two-seat derivatives of the ‘Flanker’, which have achieved significant export success. The multi-role two-seat family was derived from the Su-30 interceptor developed for the USSR and fielded in small numbers. Itself based on the two-seat Su-27UB, the Su-30 added an in-flight refuelling probe and other changes for the long-range mission. The Su-30 led to the multi-role Su-30MKI developed by the Irkut company for India, which has signed up for 272 aircraft. The Su-30MKI includes advanced avionics suite, including a phased-array multi-mode radar, precision-guided air-to-surface weapons, canard foreplanes, a more sophisticated FBW system and thrust-vectoring engines. The definitive Su-30MKI was preceded by a batch of eight Su-30Ks equipped to a basic configuration. Essentially similar to the Su-30MKI are the 18 Su-30MKM aircraft (for Malaysia), the 44 Su-30MKA aircraft (for Algeria) and the Russian Su-30SM. Less sophisticated is the Su-30MKK two-seat multi-role ‘Flanker’ developed for China by the KnAAPO plant. China received 76 aircraft followed by 24 of the Su-30MK2 derivative optimized for anti-shipping. Other customers for the KnAAPO product comprise Venezuela (24 Su-30MK2V), Vietnam (24 Su-30MK2), Indonesia (two Su-30MK and nine Su-30MK2) and (six Su-30MK2). The Russian Air Force’s Su-30M2 is also broadly similar. The definitive single-seat ‘Flanker’ was conceived in the early 2000s, initially for export. The Su-35 has been ordered by Russia and features a completely new airframe structure, avionics, systems and powerplant. Although not fitted with canards, it includes the super agility of the Su-30MKI family thanks to its 142.2kN (31,900lb) thrust-vectoring Saturn AL-41F1S engines and advanced FBW system. The Su-35S is capable of employing all Russian new-generation air-to-air and air-to-surface guided weapons. Known to Sukhoi as the Su-27K, and to the Russian military as the Su-33, the ‘Flanker-D’ is a carrier-based air superiority fighter that was first flown in August 1987. Compared to the ‘Flanker-B’, the Su-33 features an arrester hook, canard foreplanes, a folding tail ‘sting’, folding wings and tailplane, a strengthened twin nosewheel, modified flight control system, increased-area fin and a retractable flight-refuelling probe. The weapons control system is similar to that of the baseline ‘Flanker-B’, essentially restricting it to air defence missions. The carrier version entered series production in the early 1990s and in 1993 the first batch of four Su-33s entered service. By 1998 as many as 24 ‘Flanker-Ds’ had been accepted by Russian Naval Aviation and these serve as primary fighter equipment aboard the Russian Navy’s sole aircraft carrier Admiral Kuznetsov. A specially marked Su-27 ‘Flanker-B’ of the Russian Air Force Training Centre at Lipetsk in the mid-1990s. This unit is tasked with training weapons instructors and developing tactics. The Su-27 features a prominent leading edge root extension (LERX) that provides additional lift, helping destabilize the heavy radar nose. The starboard wing root contains a 30mm (1.18in) cannon. The original ‘Flanker-B/C’ production models can carry weapons on a total of 10 external hardpoints: one on each wingtip, two under each wing, one under each engine nacelle and two in tandem on the fuselage centreline. This entry was posted in Aircraft, Russia, Soviet by MSW. Bookmark the permalink.